Mighty Coconut's first foray on the Google Play Store offers up quite a unique gameplay experience. Their title is called 57° North for Merge Cube, and it is an augmented reality choose your own adventure game that requires the use of a third-party foam cube from a company called Merge Labs, Inc. Suffice to say it may be a bother to purchase yourself one of these cubes, though the gameplay of 57° North is most definitely worth the added effort and cost. I would like to first point out that Mighty Coconut has been kind enough to secure me one of these Merge Cubes and a copy of their game 57° North. Despite the free swag I am going to be as objective as possible about this game release and its required accessory. The first thing to note is that 57° North is a premium release. That means you will have to first purchase it in order to play. You can pick it up from the Play Store as of today for $2.99 without having to worry about any advertisements or in-app purchase. The problem is that the title will not work unless you own a Merge Cube, which adds an additional cost of at least $9.00. Luckily the cubes are readily available at Walmart, so you can easily order one or simply drop by a store and pick one up. Still, with a $12 total cost for the game and cube, plus the extra effort required to find the cube, this release may be difficult to swallow for the average Android gamer. Now don't get me wrong, Mighty Coconut has created a great game that contains a fantastic story and an absolutely gorgeous art direction. The premise is simple enough for anyone to jump right in and understand what is happening, but there are still enough twists and turns to the plot to keep things exciting. Basically, two cousins have been shipwrecked on a remote island in Alaska, and it’s up to you to help them survive, escape, and maybe even discover some hidden secrets about their location. 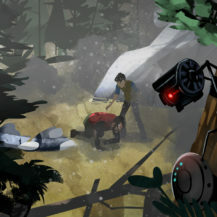 As this story plays out you are treated to some beautiful watercolor images and animations that look fantastic superimposed on the Merge Cube. Of course, what is really unique and exciting about the release of 57° North, is the fact that the entire game plays out in augmented reality by rendering its imagery directly on the Merge Cube. You have the option to play in a handheld mode by holding your phone or tablet as you view the cube through your camera on your screen. Or you can use a virtual reality headset with your phone (such as Google's Cardboard, though you will have to create a hole for the rear Camera) to view the cube hands-free. When you are viewing the cube through the game, you will see that it appears on your screen as a wooden block with arrows around a few of its sides. By turning the cube in the proper direction, you will start your adventure. 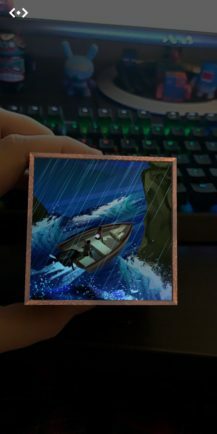 Once you are in the game, you will come across events that ask you to choose which way you would like to turn the cube. 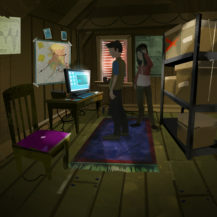 Turning the cube coincides with a few different choices you are required to make in order to advance the story. 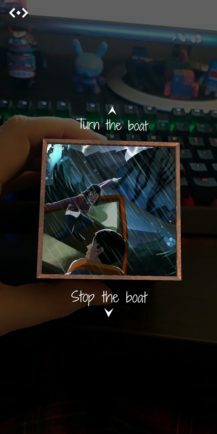 This is where the choose your own adventure gameplay comes into play, as it is up to you to direct which way the story should go. 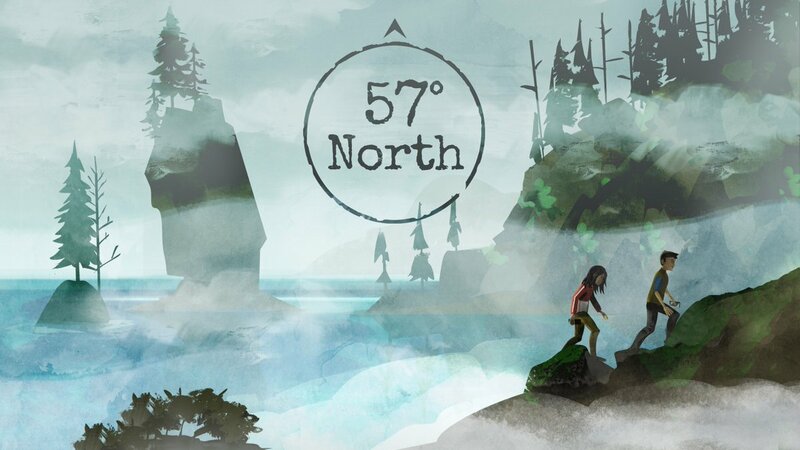 Like most choose your own adventures, there are many branching paths within 57° North. This means there is a good bit of replayability on offer as there are multiple ways to go about finishing the story. Repeated playthroughs are a must for any completionist, as it is certainly interesting to see where each branching path leads. Now obviously any mobile game that requires some kind of extra peripheral purchase is going to have trouble finding an audience. It is going to take an extensive library of quality games to ensure that the Merge Cube isn't just another item in a long line of failed accessories for mobile gaming. 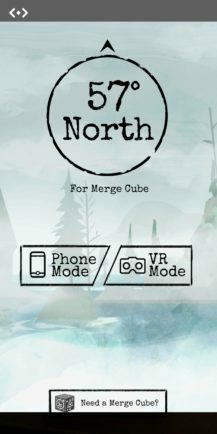 Luckily there appear to be quite a few Merge Cube ready titles already available on the Play Store, which can make the purchase of the cube a little easier to swallow, as you will have plenty more games to check out on top of 57° North. 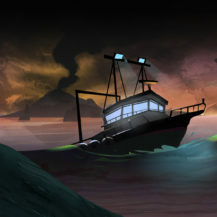 When considering 57° North on its own, I have to say that it is a quality choose your own adventure game that offers an intriguing story and some great art. Adding in the fact that it is played as an augmented reality experience that can also pull double duty with a virtual reality headset makes the purchase a lot more complicated thanks to the Merge Cube requirement. I can't say that is necessarily a bad thing, as I have had a good time with this release. But I can totally sympathize with anyone who doesn't want to go through the trouble of purchasing the required Merge Cube. In the end, I would say I have never played a game quite like 57° North. 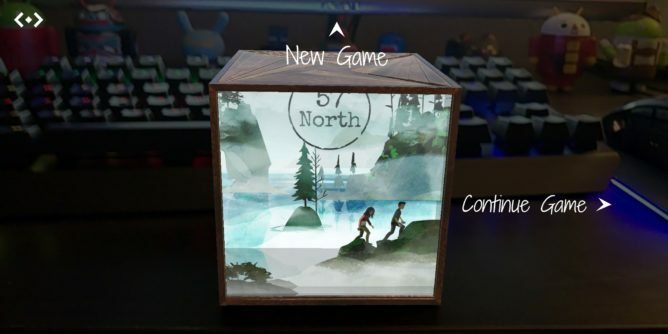 If like me you are tired of playing the same old games and you want to experience something fresh that isn't like anything else you have ever played, 57° North and its required Merge Cube accessory may just be the change in scenery you have been looking for.